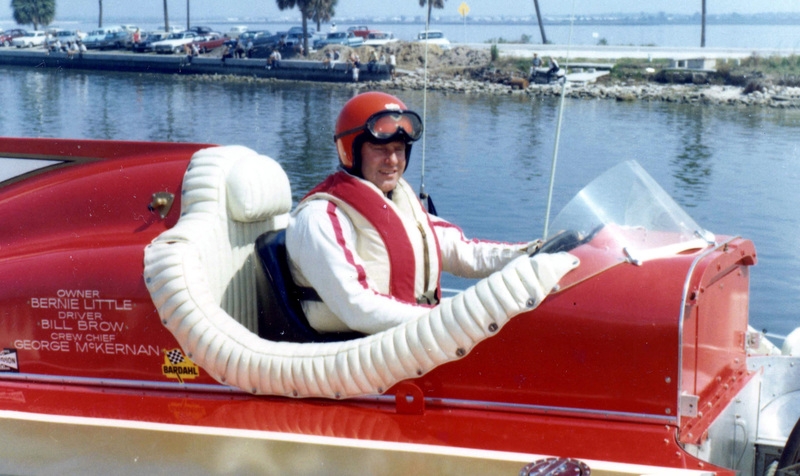 Bill Brow: "The World's Fastest Milkman"
Bill Brow--"The World's Fastest Milkman"--from Burien, Washington, raced Unlimited hydroplanes from 1958 until his tragic death at the Tampa Suncoast Cup in 1967. Best remembered as being the first to qualify for the APBA Gold Cup at better than 120 miles per hour with the Miss Exide at Seattle in 1965, Brow scored six Unlimited race wins, including a first-ever victory for the Miss Budweiser. Brow worked his way up to the Thunderboat category after many years of driving Limited hydroplanes in the Seattle area, including his own Miss Vitamilk. In mid-season 1958, a local Unlimited, the Miss Burien, needed a driver, and Bill got the assignment. Miss Burien, truth to tell, was a "backyard job," built in 1956 [as Tempest] as a hobby by original owner Norm Christiansen and maintained by a volunteer crew. The boat measured 27 feet 4 inches, which is now considered rather short for anything with an Allison engine. Brow demonstrated his potential in his very first appearance as an Unlimited driver. Midway through Heat 1-A of the Diamond Cup at Coeur d"Alene, Idaho, Bill and Miss Burien were running third behind Fred Alter in Miss U.S. 1 and Bill Muncey in Miss Thriftway. Then, while exiting the lower turn, Brow executed a daring maneuver. He drove through Muncey's roostertail, took the inside lane away from him, and accelerated into second place, leaving Miss Thriftway far astern. Brow averaged 101.580 for the 15 miles, compared to Muncey's 96.878. This was the first heat at over 100 miles per hour in the three-year history of the Miss Burien hydroplane, whose previous pilots included Bill Tonkin, Norm Evans, and Mira Slovak. There was no question in the mind of owner Peter Woeck. Bill Brow definitely had "the right stuff." Indeed, much would be heard from this talented rookie in the years to come. While most of Bill's remaining appearances with the Miss Burien were hampered by mechanical difficulty, he made his competitive presence felt on several occasions. These included a sterling performance in qualification at the 1958 Gold Cup on Seattle's Lake Washington. Brow posted a 9-mile average of 111.570 around the 3-mile course. Only the Maverick with Bill Stead and the Hawaii Kai III with Jack Regas ran faster with speeds of 119.956 and 113.445 respectively in an 18-boat field. Brow qualified higher than such well-financed entries as the Miss Thriftway, the Miss U.S. 1, the Miss Supertest II, the Gale V, and the Miss Bardahl. Bill's association with the Peter Woeck team ended on the same race course where it had begun in 1959. Miss Burien flipped upside-down and sank during Heat 2-A of the Diamond Cup. The boat was destroyed and Brow spent the night in the local hospital. Ironically, in the re-run of the same heat in which Bill had been injured, another craft--the "Green Dragon" Miss Bardahl--also had an accident. The Bardahl's driver, Jack Regas, was critically hurt, although the boat was not badly damaged. When Miss Bardahl returned to action a month later at the Silver Cup in Detroit, Bill Brow was at her wheel and took an overall fifth. Bill would see intermittent duty with the rough-riding "Dragon" over the next couple of years. He managed a third at the 1959 Indiana Governor's Cup in Madison and a second at the 1960 Mapes Trophy in Reno but was replaced by Ron Musson for the 1961 season. Brow briefly handled both the Miss Seattle and the Miss Seattle Too during 1962 but was back racing Limiteds in 1963. Then came the call from Milo and Glen Stoen to drive the Miss Exide at Madison, Indiana, as a one-race replacement for Mira Slovak, who had been injured at the Diamond Cup. Here was the opportunity of a lifetime! Miss Exide was the famed former Miss Wahoo, one of the most competitive boats in Unlimited history. At long last, Bill had a ride that was truly commensurate with his ability. He traded heat victories with Don Wilson and the Miss Bardahl at Madison to win the 1963 Governor's Cup decisively. Brow and Miss Exide outran Miss Bardahl 110.974 to 108.281 in the Final Heat, followed by Bill Cantrell in Gale V, Walt Kade in Blue Chip, and Buddy Byers in Miss Madison. So impressed was Mira Slovak by his relief driver's performance that Mira "retired" himself on the spot. "The boat is yours," he told Bill. After five years of paying his dues, Bill Brow had achieved the big time. Brow and Miss Exide made it two in a row with a victory two weeks later in the President's Cup at Washington, D.C. In a race that had to be curtailed on account of wind, Exide outran Bardahl once again, 108.695 to 107.569 in Heat 1-B. Despite not having a boat to drive until the last month of the season, Brow still finished sixth in a field of 22 drivers competing in 1963. In so doing, Bill won the "Comeback of the Year" distinction from Bob Brinton's Unlimited Hydroplane News. The 1964 and 1965 seasons were an exciting time for the sport with seven different boats winning races. Brow in Miss Exide, Musson in Miss Bardahl, Chuck Thompson in Tahoe Miss, Muncey and Rex Manchester in Notre Dame, Warner Gardner in Mariner Too, Cantrell and Danny Foster in Miss Smirnoff, and Byers in Miss Madison all helped to make things interesting . . . and competitive. Bill Brow achieved victory at Coeur d'Alene twice during this period. In 1964, he edged out his perennial nemesis, the Miss Bardahl, 108.783 to 108.346 in the Final Heat. In 1965, Brow outran the opposition in both of his preliminaries and then cruised to a safe third in the finale to win the Diamond Cup on total accumulated points. The Seattle Seafair Regatta always seemed to be a jinx race for Bill. In 1964, he and Exide tied Musson and Bardahl on points, and Brow won the Final Heat going away, while Musson was nursing a sick engine. And yet the victory went to the "Green Dragon." This was because the Miss Bardahl had completed the 45-mile race a mere two tenths of a second faster than the Miss Exide, 106.522 miles per hour to 106.508! In 1965, Seattle hosted the Gold Cup. Brow qualified fastest, posting a three-lap average of 120.356. This finally eclipsed Maverick's 119.956 record set on the same race course in 1958. Brow's best lap of the three was another first: 120.536 -- which beat the previous high of 120.267, also set by Maverick in 1958. On race day, the jinx appeared to have been beaten when Miss Exide roared to a record-breaking victory in Heat 1-A, averaging 112.172 for the 15 miles, compared to 109.800 for the second-place Tahoe Miss. Going into the Final Heat, Brow and Exide had to be regarded as at least the co-favorites to win. But this was not to be their day. Miss Exide caught fire on the first lap and within moments was a raging inferno. Bill escaped unhurt but his team's chances were literally up in smoke. The Gold Cup went instead to Miss Bardahl, while Miss Exide sat forlornly on its trailer -- a gutted hulk. In the face of predictions that the boat was beyond repair, Brow and his crew chief, George McKernan, had Miss Exide back in action seven weeks later, appearing none the worse for wear. The team took third place in both of the last two races of the year, at Lake Tahoe and San Diego. For 1966, Bernie Little entered the ownership picture. The Stoen brothers retired from racing, and the Miss Exide became the Miss Budweiser. Along with the hull, Little acquired the equipment, the top-notch crew, and the cockpit services of Bill Brow. But bad luck would continue to plague the team. In the opening race of the season at Tampa, Florida, Brow suffered a broken shoulder. A week later, relief driver Don Wilson had the Rolls-Royce Merlin-powered projectile in first-place and appeared on his way to a victory in the President's Cup at Washington, D.C., when the Miss Budweiser collided with the Notre Dame, driven by Rex Manchester. Wilson and Manchester were both fatally injured, and both boats were destroyed. Solemn but undaunted, Little bought a brand new hull from builder Les Staudacher for Brow to drive. In two weeks time, the new "Beer Wagon" was rushed to Detroit where it sank on its first trial run with a small hole in the bottom. Pumped dry and repaired, Miss Budweiser achieved victory three weeks later on the Columbia River at the Tri- Cities, Washington, with Brow winning all three heats of the Atomic Cup. It was an emotion-charged moment as Bill accepted owner Little's first of many first-place trophies. The Miss Budweiser people had convincingly rebounded from their Washington, D.C., tragedy ... and had done so in championship fashion. Two weeks later, Brow had another bad experience in Seattle, flipping in the Final Heat after winning both of his preliminary skirmishes decisively. In what would prove to be his last appearance in Seattle, Bill at least had the satisfaction of turning the two fastest heats of the day with speeds of 106.215 and 108.870 in sections 1-B and 2-A respectively. Later in the season, Bernie, Brow, and Bud put it all together to win the San Diego Cup on Mission Bay. Bill again won all three heats and turned the fastest heat of the day with a speed of 109.778 in section 1-A. The Miss Budweiser team probably would have won the High Point title if points could have been transferred between entries at the time. Pilot Brow nevertheless averaged more High Points per race than any other driver. In all, 1966 had been a memorable year. Off-season favorite for a 1967 national crown, the Miss Bud was prepared as few boats before her had been. New deck, remodeled sponsons, powerful Rolls engines, all were ready. Miss Budweiser was the fastest qualifier at the Suncoast Cup on Tampa Bay. In the first heat, Bill had her on top, vibrating with incredible speed, when the craft flew into the air, cartwheeled*, and crashed. In the twinkling of an eye, Miss Budweiser was a shattered wreck. Attempts to revive the stricken driver proved futile. It was the end of the line for "The World's Fastest Milkman." Bill Brow is gone but not forgotten. Two of his sons, Jack and Doug, have followed in their father's footsteps by driving Limited hydroplanes on the American Power Boat Association circuit in the Seattle area. In 1997, Doug Brow made his Unlimited Class debut at the Seattle Seafair race, much to the joy of many long-time followers of the sport. Doug drove a boat that was appropriately named the Miss Exide. In 1972, Fay Brow, Bill's widow, instituted the Bill Brow Memorial Trophy. This handsome award is presented each year by the Brow family to the fastest qualifier at the Seattle Unlimited race. The trophy is a fitting tribute to the man who played such a vital part in the awesome spectacle that is Unlimited hydroplane racing. A Perspective . . .
Bill Brow was killed in a racing accident during the first race of the 1967 season when his reworked Miss Budweiser barrel rolled on the backstretch during the Suncoast Cup on Tampa Bay 6/11/67. News footage showed the boat leave the water at an incredible rate of speed and roll over three times before returning to the surface and disintegrating. It was said at the time that 700 lbs. had been shaved off the relatively new hull (entered service at the 1966 Gold Cup race 6/29/66) in order to correct a problem with stickiness. I saw the boat run during Gold Cup trials and the subsequent race of 1966 . The mahogany, red and white Miss Bud resembled the Tahoe Miss and threw an enormous roostertail much larger than the other boats . This was due to a propeller shaft angle that was to severe which did not allow the boat to plane properly. Later that season Brow flipped this Budweiser in the final race. It seemed to me that the setup on this hull, which was rushed in to service, never was perfected and that this and Brow's rather rash nature were responsible for his death. *A correction to Fred Farley's article [above]: The Miss Bud did not cartwheel but barrel-rolled (3 times). And Another Perspective . . . I grew up in Tampa, and for a few years in the 60's, the unlimiteds raced just off the Courtney Campbell Parkway (the road which connects Tampa to Clearwater across the northern end of Tampa Bay, near the airport). I was a teenager at the time and we had a boat. I still recall walking around the pits the day before the races and seeing Notre Dame (with gold leaf trim), Budweiser and others. In 1967, we were anchored on the back stretch, when on the first lap of the first heat, Miss Budweiser, driven by Bill Brow, came off of turn 2 and rocketed ahead of the others. About a third of the way down the back stretch she appeared to hit a roller and started to sponson-walk, which progressed to the point she swerved and rolled over, plunging to the bottom. Bill kicked out as the boat went over right in front of us, and the rescue helicopter literally was hovering before the bubbles subsided. I do have the original Tampa Tribune sports section with the details stored away, and with some digging, I could find it. I still see it in my mind, and the most remarkable thing was that there was almost no splash. When she rolled over while in the air, she hit the water nose down and simply vanished. All that was left was the white bubbles foaming up, and the unconscious driver floating. The rescue helo, which had been circling was there before the ripples stopped, but it was too late for the driver as he was DOA at the local hospital (less than a three-minute chopper ride away).